Here's another one cleaned up and entered into the collection. I got this snare drum at the 2011 Chicago Show from our good friend and fellow collector, Mark Cooper of Cooper's Vintage Drums. *The Broadcaster Model was very short-lived so for those of you that may not be familiar with this model here is a short history and background data regarding the Slingerland Broadcaster Model. The following is from Rob Cook's Slingerland Book (first edition): "The Broadcaster was evidently a forerunner of the Radio King, the strainer is a very early Radio King style strainer and the lugs do not have inserts. (The tension rods thread directly into the lugs.) The muffler was the single-pad style Harold R. Dodd muffler." Thanks again to Rob Cook. I have also read that Slingerland was legally forced to discontinue using the word "Broadcaster" (with a "c") as the Fred Gretsch Co. had been using the name "Broadkaster" (with a "k") on their drums way before Slingerland and therefore the court ruled in favor of Gretsch that Slingerland's Broadcaster was too close sounding/looking to Gretsch's Broadkaster. The Shell: The Sparkling Green wrap was in pretty good shape with very few of those black "cancer" spots that usually show up on these older Green Sparkle drums. I was able to get a few layers of age off of the wrap with my Maguire's cleaning/polishing regime and the Sparkling Green finish came back to life. The solid maple shell interior was also in good shape and only needed a very light cleaning. The cloud badge was tight and weathered the last 75+ years pretty well. The Hardware: I'll call it Slingerland Artgold but the hardware finish on this snare drum really resembles the Ludwig & Ludwig Classic Gold (brass plating with gold lacquer) finish that L&L used on their early-mid 1930s Black Beauties. There was a lot of Artgold present but an equal amount of age and tarnish. I haven't figured out how to duplicate the Classic Gold finish yet so the decision was to leave the hardware as is and just do a simple cleaning with a light coat of gold lacquer to seal everything to prevent any further tarnishing. The 16 tension rods were not correct so I went to my stash and found the correct tension rods but these had to be brass plated, antiqued and lacquered. Thanks again to Les and Brian Hadnagy of Avenue Plating for the brass plating and antiquing. 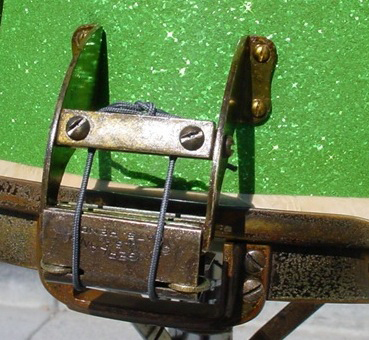 The threaded snare gates have the letter "A" stamped on the inside (not seen) part of the rim and gates. 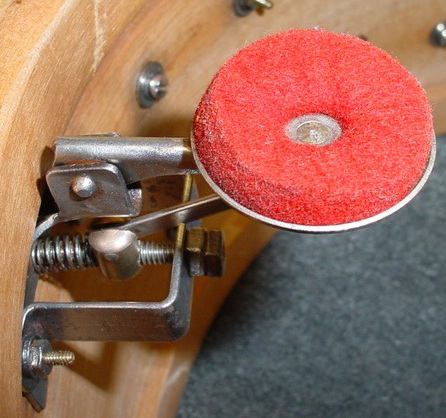 This is called a "manufacturer's cartouche", thanks to Slingerland expert Dr. Carl Wenk for that information. I'd love to know if those type of markings are under the riveted snare gates, feel free to send photos. The Slingerland Broadcaster engraving on the top rim is pretty faint but it is there. All in all, the "carpet matches the curtains" pretty well on this drum. Of-the-era calf heads and extension wires rounded out this cleaning/restoration.